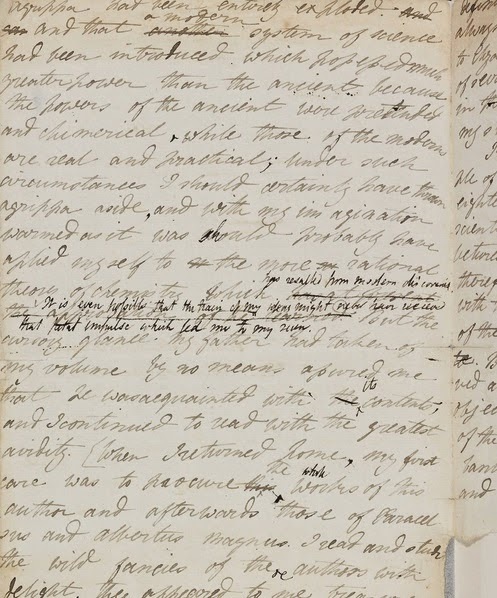 If you have a spare hour or ninety, have a browse through the Beta version of the Shelley-Godwin Archive, a project to make available in digital format the handwritten manuscripts of Percy Bysshe Shelley, Mary Shelley, William Godwin, and Mary Wollstonecraft. So far only Frankenstein has been scanned, but that's plenty to get excited about (well, for us editors, anyway). You can read the entire manuscript online, together with the transcription and highlighting of Percy Shelley's edits and alterations to Mary Shelley's text. It's an opportunity to examine a classic author's writing process. You can read more about the project here, and detailed guidelines on how to use this remarkable resource can be found here. I think this would be interesting from a historical perspective, that is, the evolution of writing from the time period of these manuscripts to today. I wonder whether the fact that writing has changed to meet current reader demands will limit their practical value, or whether insight into these authors' thought processes will in some way help us with ours. It's worth taking a look to see if that might be the case. 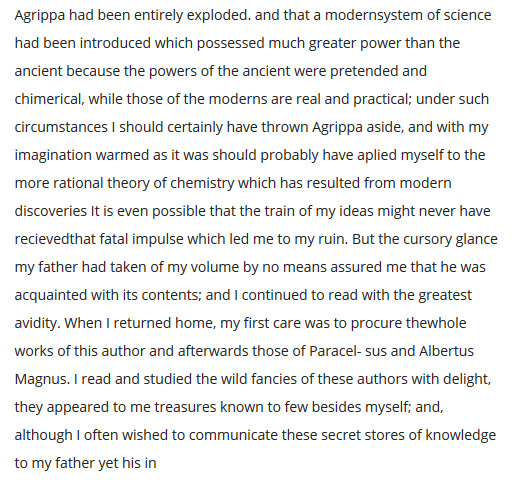 Having recently waded through Frankenstein, I can tell you it's written in a very different style to what we are used to reading today. But I think I did learn from it anyway, specifically regarding the unsatisfactory and unconvincing events that led to the monster turning from good to evil. Too much was put down to coincidence, and I've tried to avoid relying on coincidence in my own writing. What an exciting project. I'd love to see manuscripts from other great writer scanned before they are destroyed by time. A person's handwriting is unique and illustrative. I hate that some schools are no longer teaching cursive. I think we will see other manuscripts being scanned, as a preservation option. In my searches I found pages available by Charles Dickens, Lewis Carroll, Mark Twain, Virginia Woolf, to name a few. That is so very cool. Having the ease of computers and spell check and all, it's amazing to see how the classics were created and the real handwriting of those minds. I haven't found a pen with 'cut and paste' yet, so anything like this impresses the heck out of me. I'm pretty sure there is software available that translates what is written using a pen-like stylus on a tablet. But in a generation or two, writing by hand will probably be a dying skill. What a shame that the OCR transcription does not preserve the over-strikes, insertions. and other editorial changes, which are in the autograph but are very hard to read. I agree, Larry; that would be a valuable option to have.